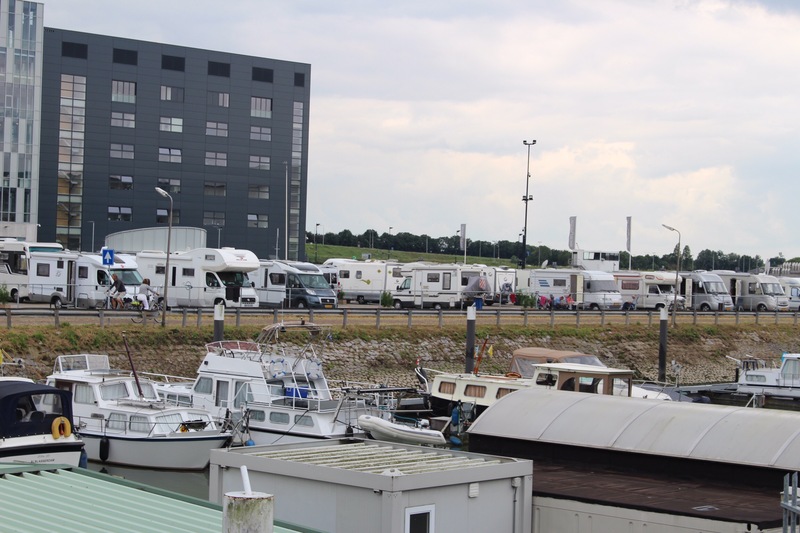 Bluebell the motorhome is parked up alongside a harbour, just south of Rotterdam on a very swanky aire. The main reason for pointing Bluebell in this direction is the lure of the UNESCO Kinderdilk Windmill site, a collection of 19 picture perfect windmills/pumps sat upon waterways that rival our beloved Norfolk Broads. 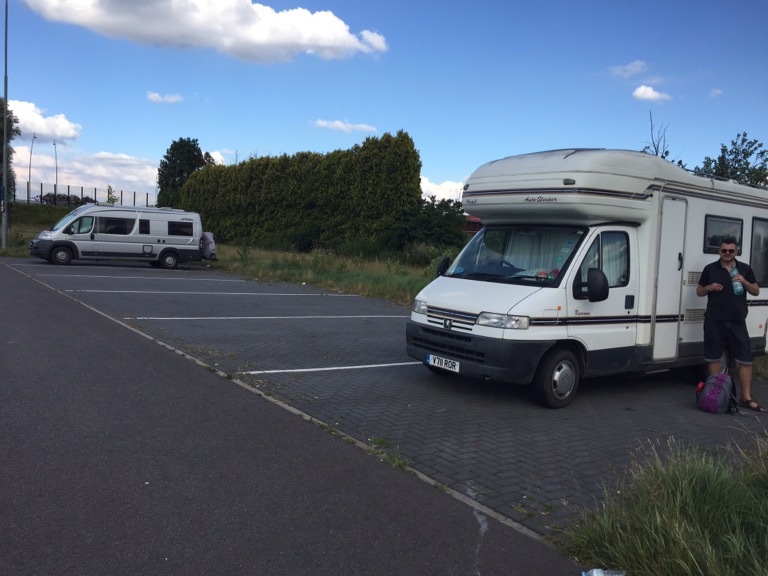 We had a slightly disturbed sleep last night in our free aire in Ronquieres with boy racers making a racket into the early hours, although thankfully not doing wheel spins in our aire, they at least stuck to the roads, but their exhaust pipes blasting us out of our sleep too many times to count. We must have slept longer than thought though as we both woke at 07:30 feeling refreshed. Before heading off we took the walk up to the panoramic viewing platform and watched in fascination from our elevated position another boat making the journey down the incline slope. It really is amazing to watch this engineering in practice. 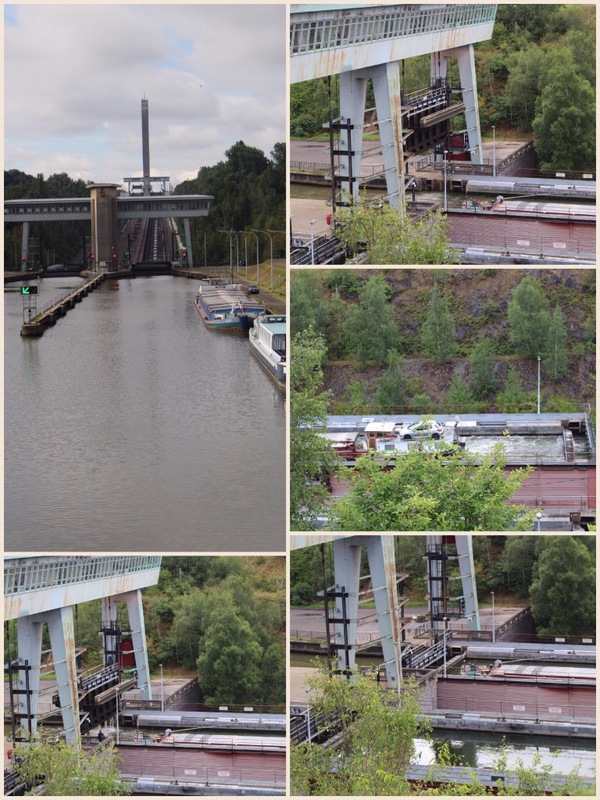 It takes a boat only 40 minutes to make the complete journey- seeing as it took boats over 4 hours to get through Neptunes Staircase locks in Fort William, you can see the appeal- gawd knows the cost to travel on it though. 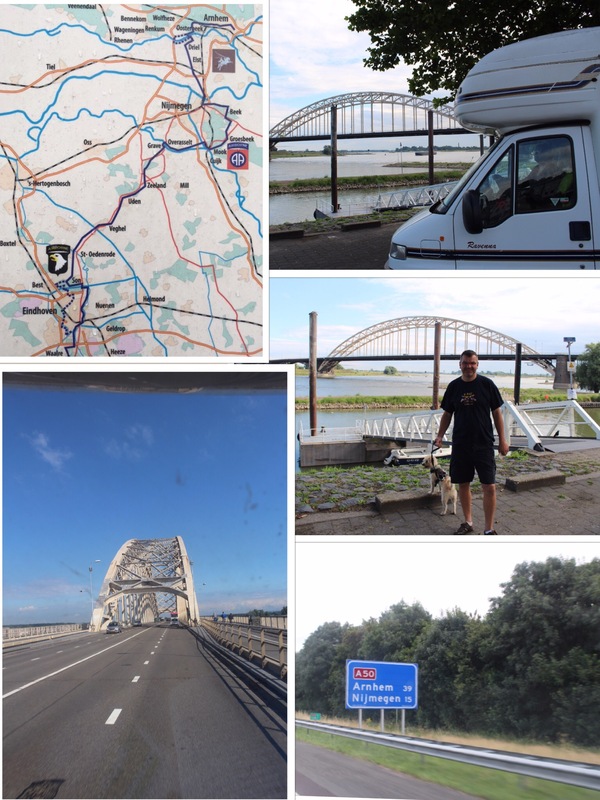 We hit the road by 10.30am and navigated our way round Brussels and Antwerp (with the biggest ring road I’ve come across- 7 lanes in one place going in 3 different directions!) 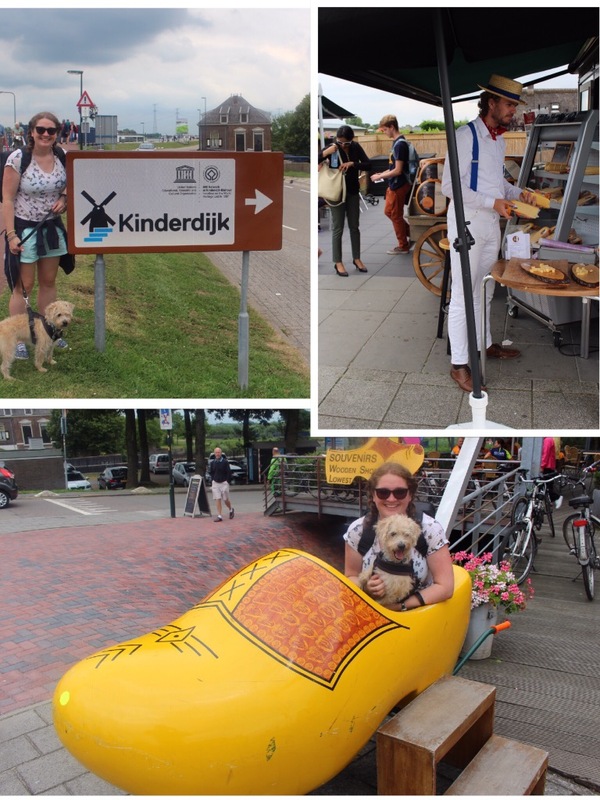 Just before 1pm we arrived at our aire, filled up/emptied, had a sausage and onion baguette and by 2pm we’d made the desicion NOT to get the bikes off and cycle to Kinderdilk but instead to go by foot on the water bus. If we had cycled we’d have been treated to a 4km off road cycle path the whole way- I’ll tell you how I know this shortly…! 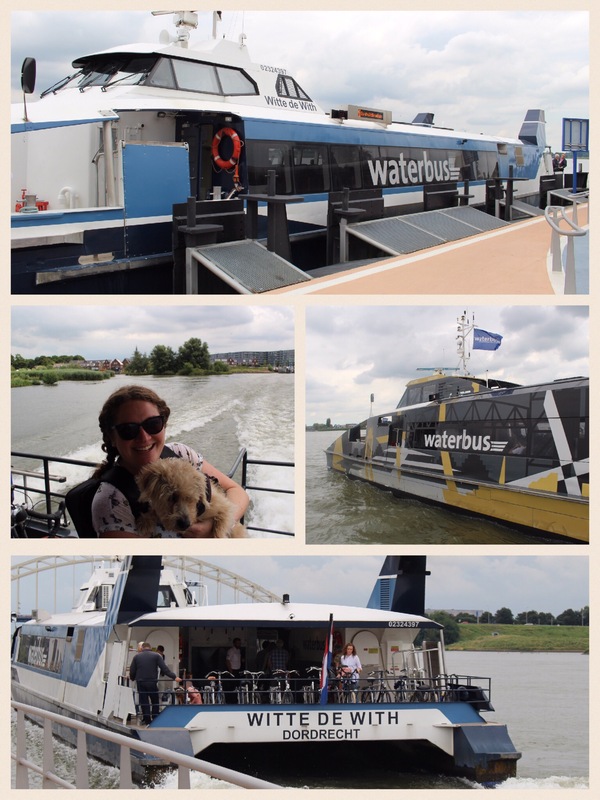 The journey on the water bus was SO EXCITING. Having not been on a catamerang I had no idea how fast we would go- it felt like a speed boat!! 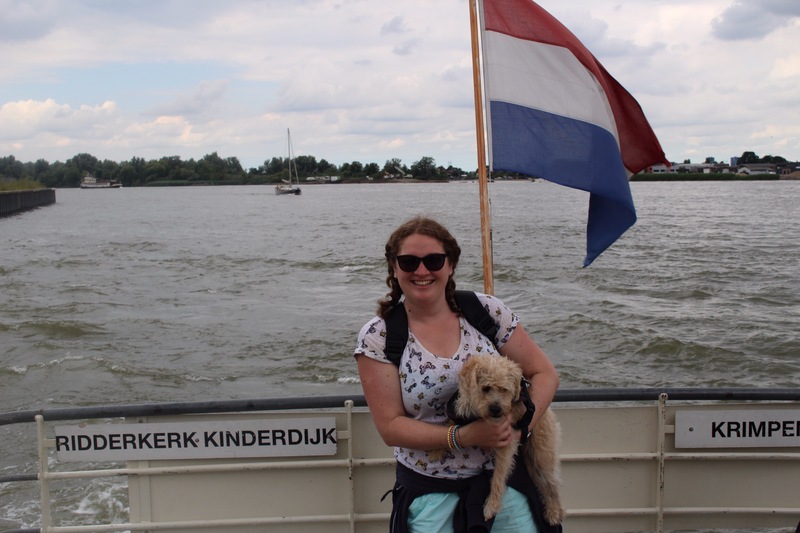 We got to Ridderkirk in 5 mins (it cost us €2 each (single fare) and Jazz was free) where we changed to a smaller slower boat to take us to Kinderdilk for €1.70 each. If we had bought our bikes.. ahem.. They would have been free. Kinderdilk was absolutely breathtaking. I am so pleased we made it, the weather was a bit dull but it didn’t matter one bit. 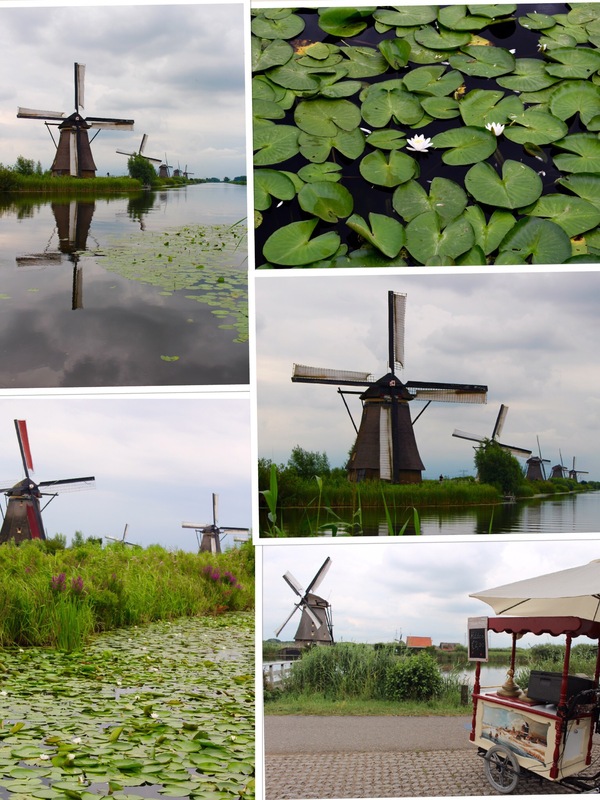 The sight of all these perfect windmills stood proudly alongside gorgeous waterways, with lily pads full in bloom and reeds rustling, was amazing. It’s free to visit if you aren’t fussed about going inside the museums etc, which we weren’t, instead preferring to enjoy a walk up the main avenue where you can enjoy the views. We picked up some local cheese from a local seller in the shop which was delicious. It was soon time to try our first Netherlands beer, and what better to try than a local Heineken. We noticed a local geocache so went off to find it before attempting to get back. We saw our boat depart as we signed the log, not realising it was of course, the last of the day. Whoops. Because of the placement of the stops on the other side of the river we were stranded and so mustered up our last bit of energy to hike back 4km along the bike path. By the time we were back to the van, via Lidl for some bits and bobs including a very strange looking but tasty cooked sausage and some €0.33 bottles of lager, we were exhausted having worked up 8miles on foot today! I rustled up sweet and sour chicken for tea and thoughts have turned to tomorrow. 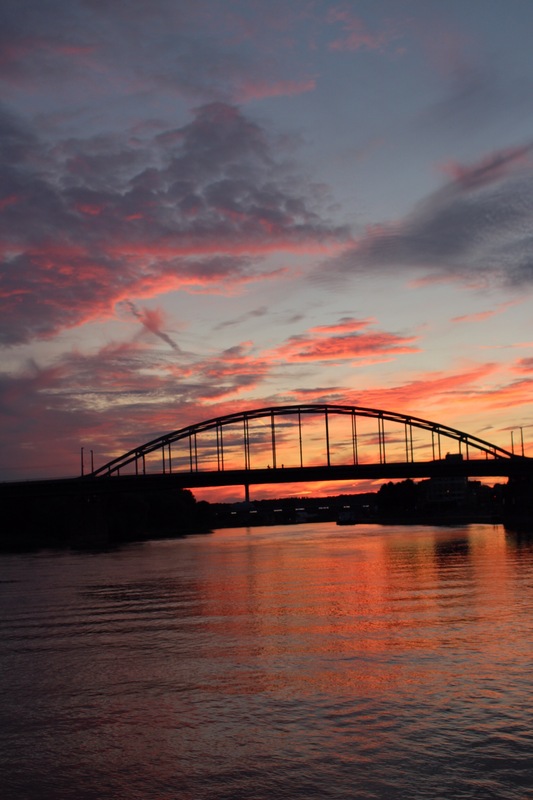 The fact that we don’t need to leave our aire until 5pm has opened up the possibility of visiting Holland’s oldest city, Dordrecht. Bluebell the motorhome is parked up on the outskirts of Eindhoven in a Park and Ride site where they have space for 10 motorhomes to stay overnight. We are officially on “Project Market Garden” following the route that the 101st airborne and others took back in September 1944. This morning we had a lazy ish morning as we wanted to visor Dordretch before leaving, but didn’t fancy the 20km round cycle, so waited for the first water bus, being Sunday this was 11:35. 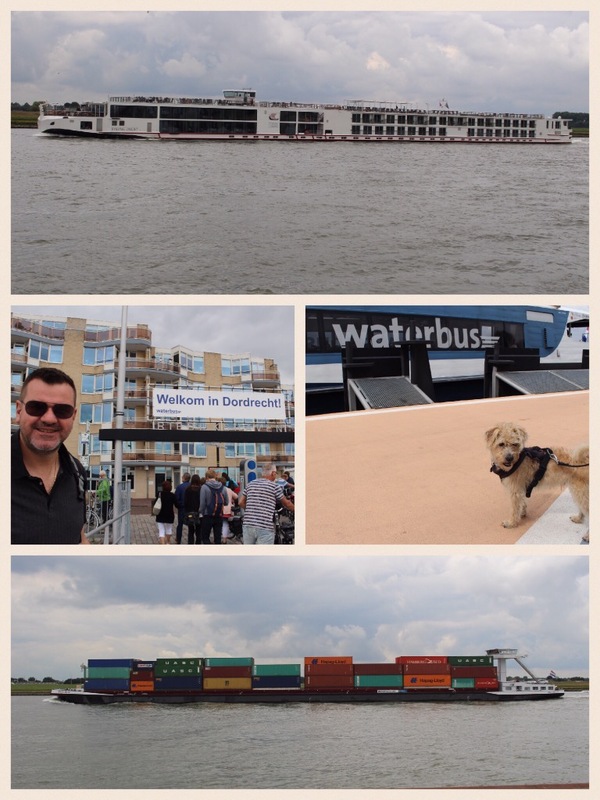 We did a couple of Geocaches and watched the world go by on the river, busy with cargo barges but also large, posh (by the looks of it!) River Cruise liners. 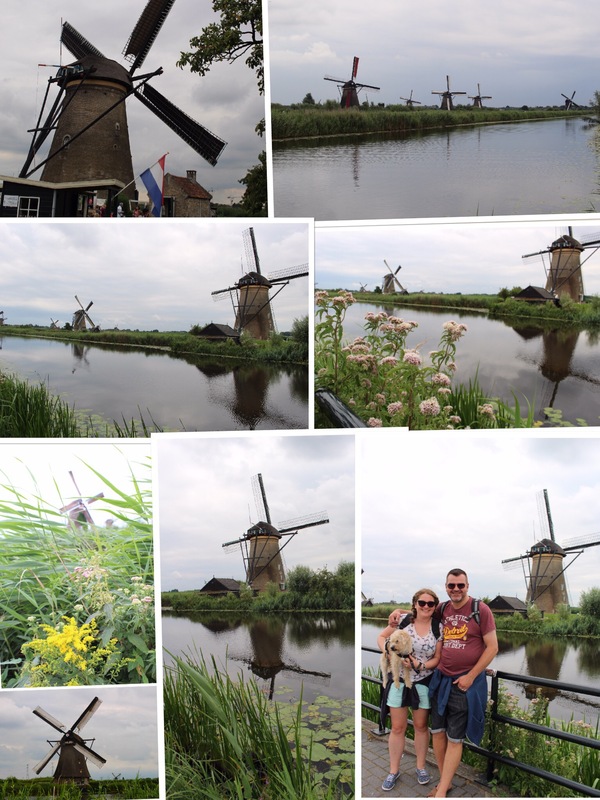 We arrived at Dordretch, Holland’s oldest city, just before 12 and enjoyed a self guided tour around the small city. 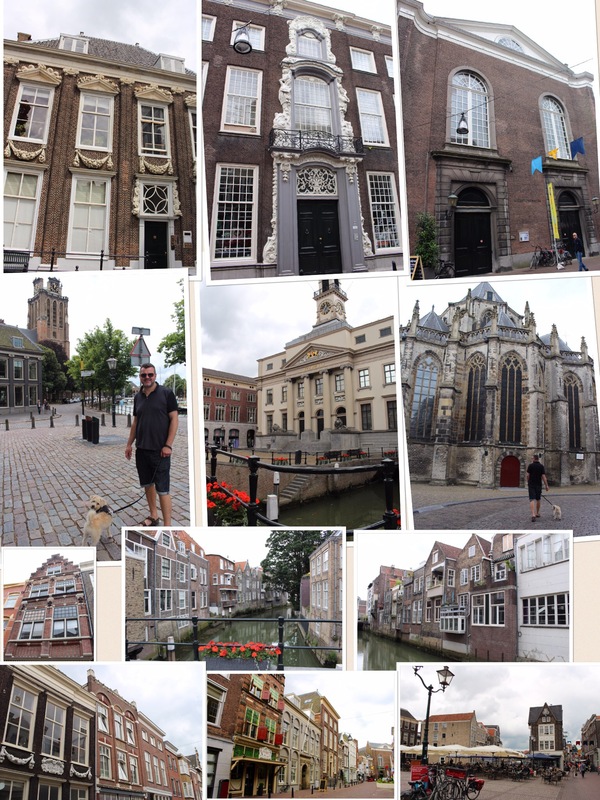 The architecture here is lovely, the cobbled streets are lined with grand town houses dating back to the 1600s, and many are edged by waterways and boats, reminding us of Venice. We were somewhat surprised how quiet it seemed, I know it’s Sunday but it felt abnormally quiet. 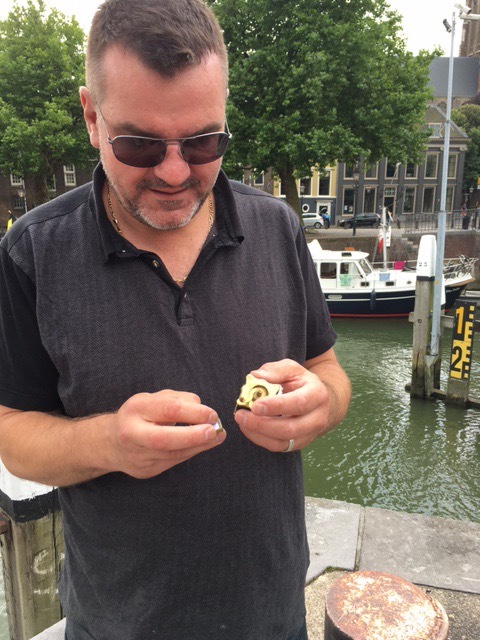 We managed a couple of geocaches, one of which involved Keith dangling over a harbour wall in return for finding a dinky little coffee grinder cache. Goodness knows what passers by thought! We chose a picturesque spot near to the Waterbus stop and had our packed lunch in the sunshine before making our way back to Bluebell, and hitting the road. 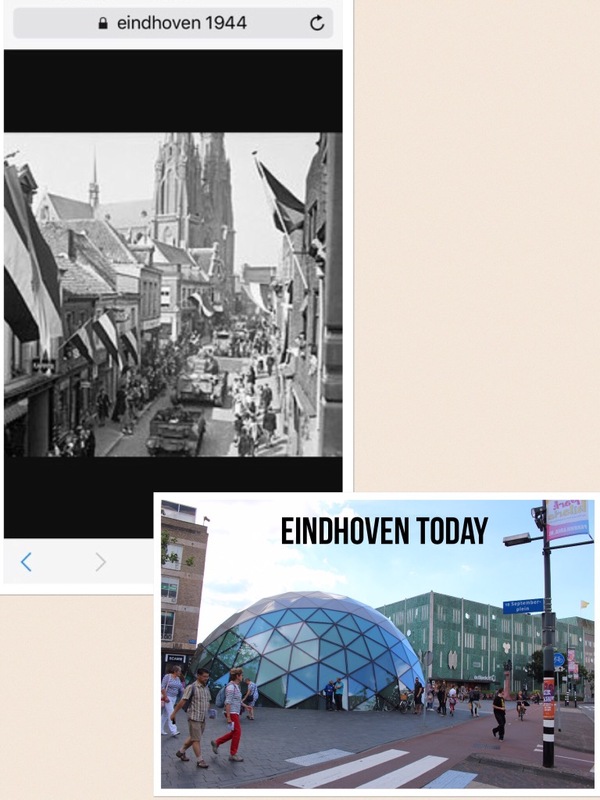 Next stop was Eindhoven, less than an hour’s drive. 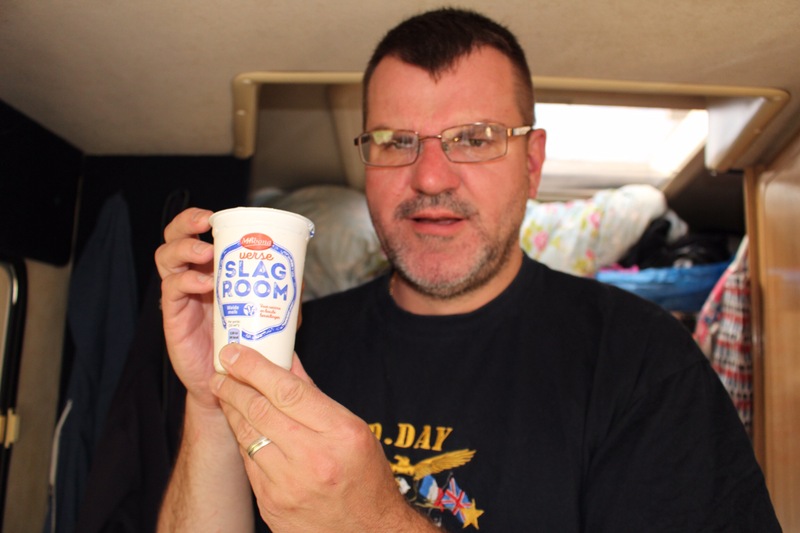 We quickly located our night stop on the edge of town, CoPilot navigation app is a godsend allowing the option to input GPS Coordinates from the Camperstop book, we are coping well with the offline map feature, it’s brill. 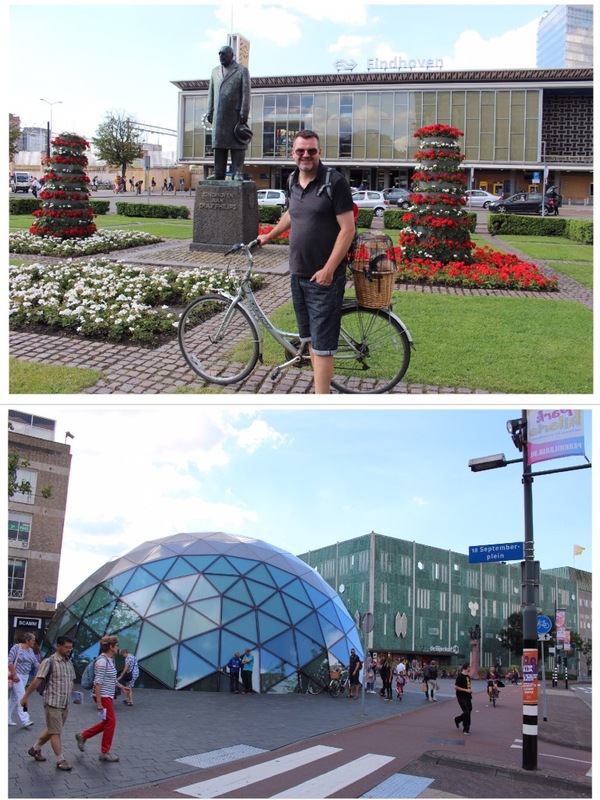 After a quick cuppa and a cake, Keith had unloaded the bikes for the first time this trip- we were off for a short cycle of 5km into town to see if we could see anything left over from WW2. He had prewarned me that there may not be anything of interest as obviously this area was badly bombed. As we cycled in there was no sign of anything, in fact it was quite 60s, which made sense. We followed the Route Eindhoven, a well signed off road path- and as we got into the centre there seemed to be nothing to commemorate the war, other than the centre square being named 18 Septembre Plaza- a shame really considering how many died. We made it to the river, and probably the point in which was secured during the war- a smallish stretch compared to the size of the river we were on earlier today. Keith looked on to check if we’d missed something but sadly not, Eindhoven seems to have made the decision to move forward without looking back. 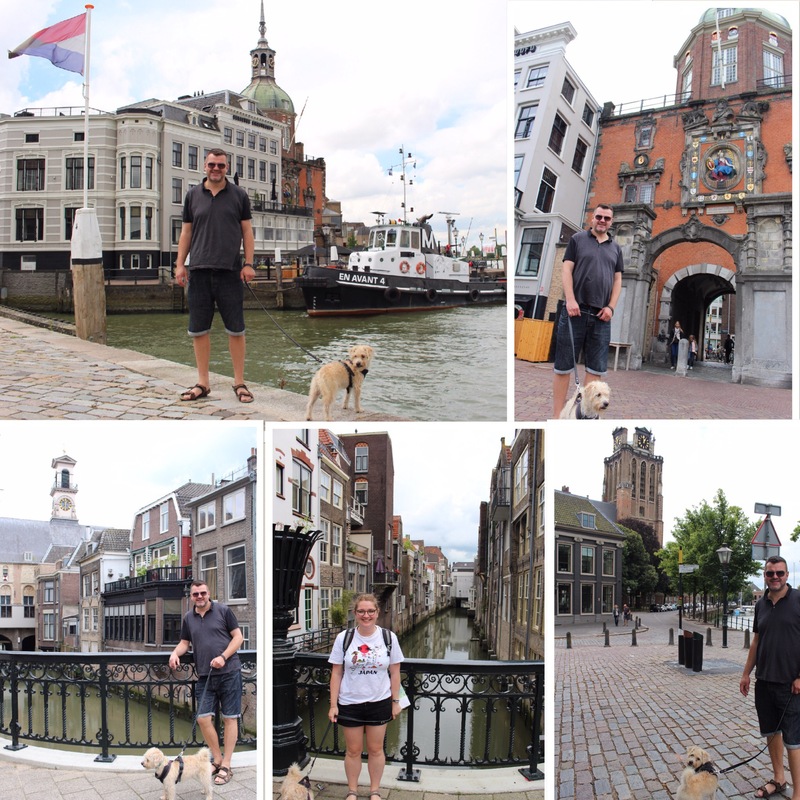 He was happy to have visited though, tomorrow we will go to Arnhem where there is lots to see (apparently), so we will be following the Route of Liberation – not sure if such a trail exists yet, if not it will be a DIY job! We enjoyed Spagetti Carbonara for tea with an extra twist of some German cooked sausage which was yum. We had a chuckle at the name of Dutch double cream. 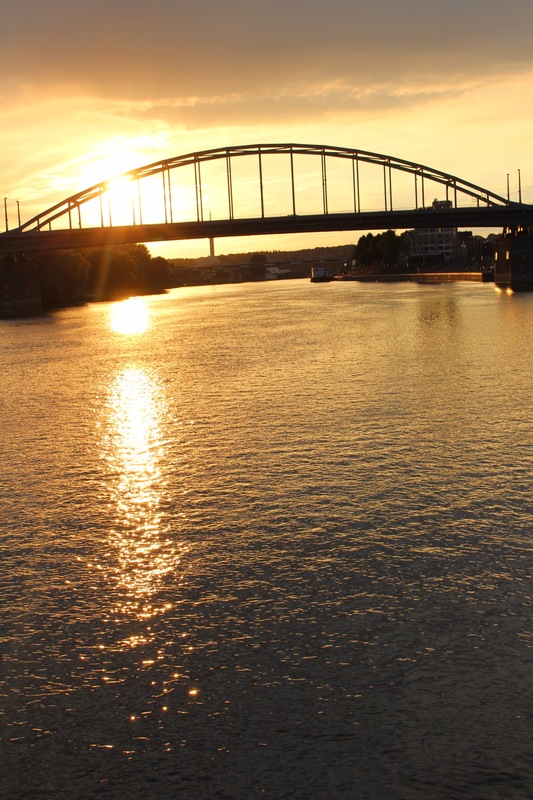 Location: Arnhem, NL aire on the river Rhine just to the side of the John Frost bridge. €9 pn with electric. GPS n51.973000 e5.916220. Full service point 1.5 km down the road at Shell garage. 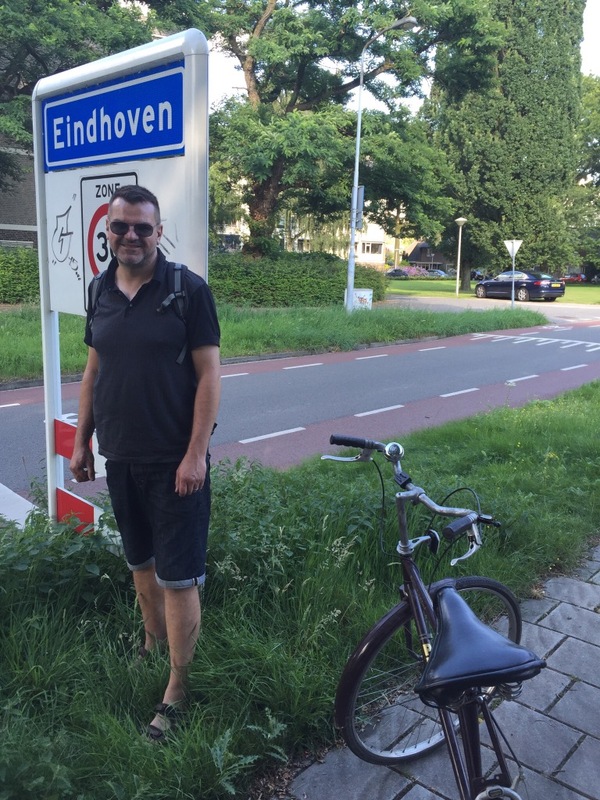 Miles Driven: Eindhoven – Arnhem 50 milesWeather: woke up to heavy rain, cleared up, sunny spells, a thundery downpour then clear! 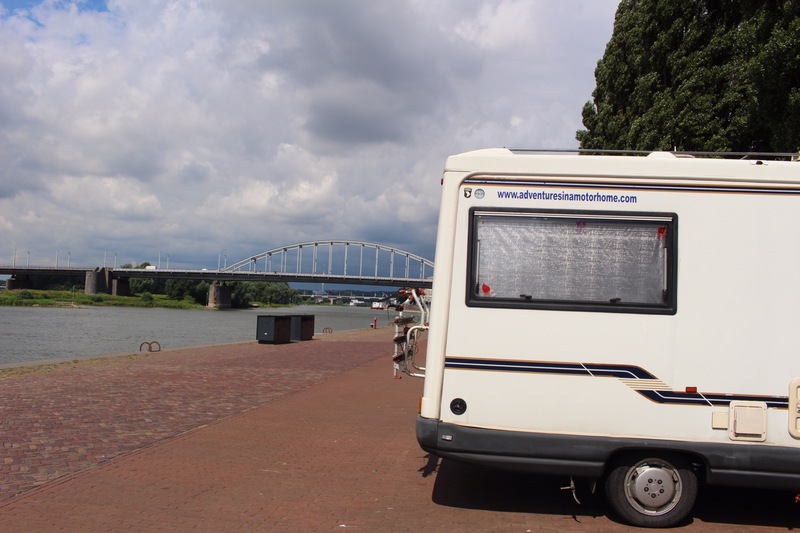 Bluebell the motorhome is parked up beside the Rhine with a magnificent view of Arnhem bridge. 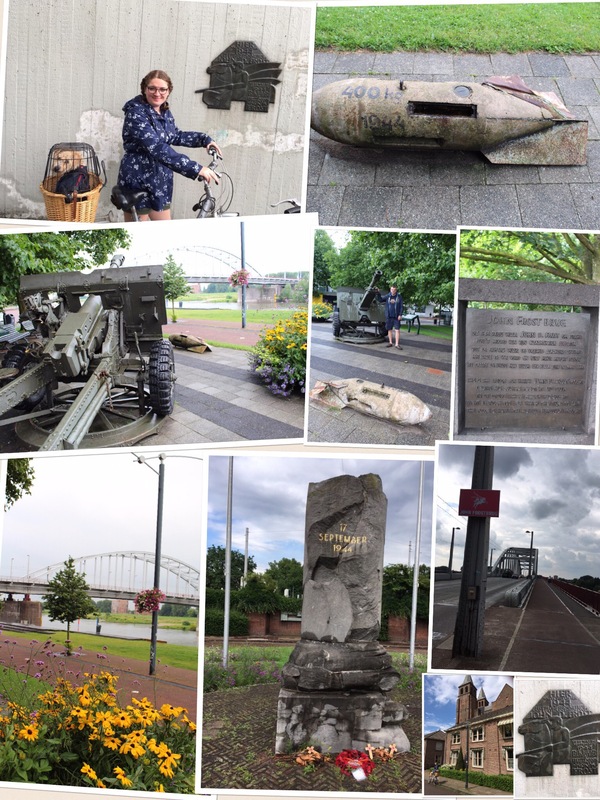 Today dawned wet and miserable but it didn’t matter as we were set to drive to Arnhem to visit but we had an hour’s drive first to get there, time for the rain to stop, which it did. 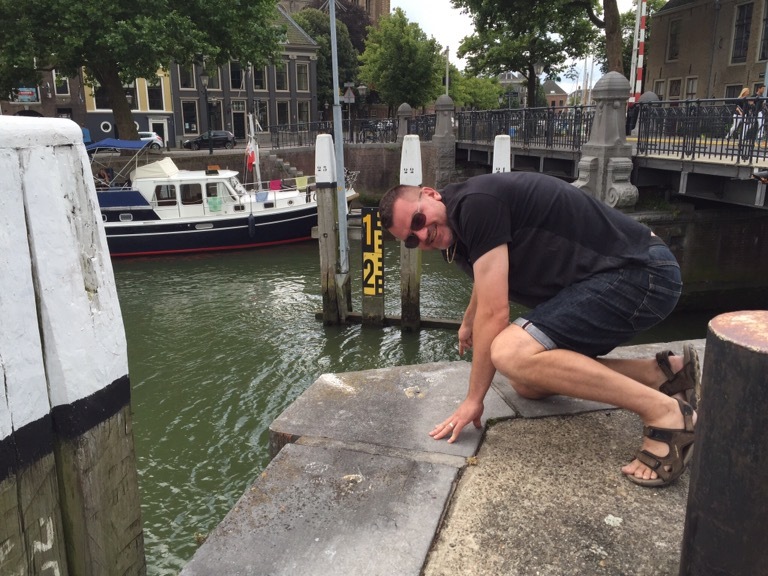 We were making a quick stop at Nijmagen so Keith could experience the route that the allies made back in September 1944. 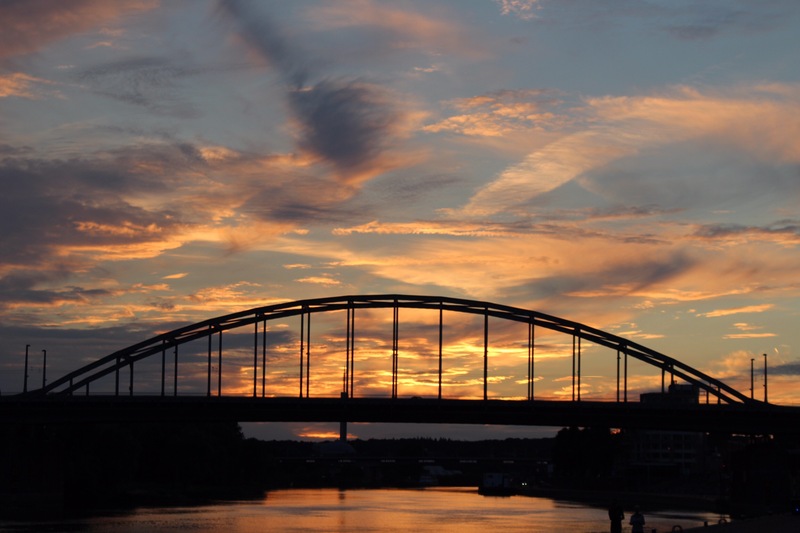 After a quick photo stop near the bridge in Nijmagen over the Rhine, we then drove over said bridge and onto Arnhem. 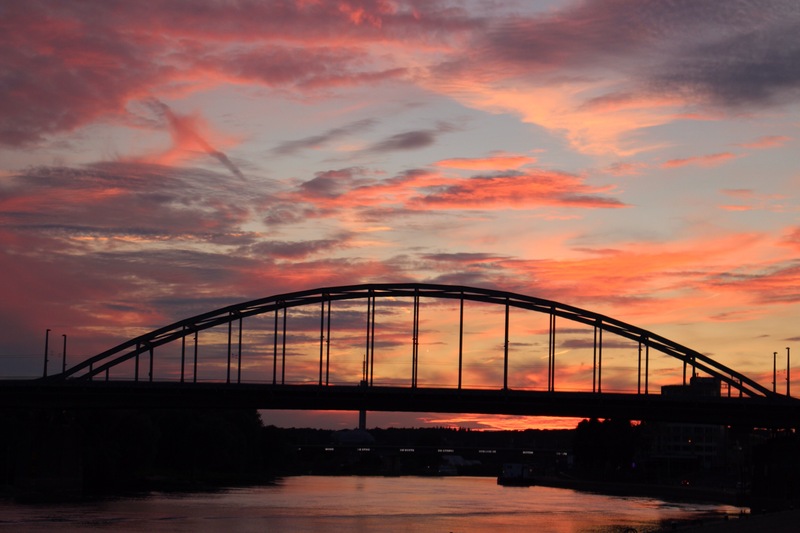 Keith was especially excited when we drove over the John Frost bridge in Arnhem, the bridge that allied forces managed to hold for 9 nights, but went off the scale when he realised our stopover for the night was near enough underneath the bridge! A quick lunch of bacon and egg baguettes after which we set off to explore the sites on our bikes. The aire is right by one of the main memorials, and also a small museum detailing the stories of those who lost their lives. Next year it looks like there will be a whole new centre being opened – something which is needed, as although we spent nearly 4 hours tying to find various memorials etc sadly there is a real lack of information points here and it made the day much harder work than we’d have both liked. Highlights of the day were the location of the aire, seeing the bridge, cycling over the bridge, seeing some of the remaining pre war buildings (however there are very few of these obviously), enjoying a beer on the main square, seeing the British John Frost headquarters (despite it now being an awful 60s office block) and last but by no means least, in fact my personal favourite of the day, the most breathtaking sunset behind the bridge right from our motorhome window. 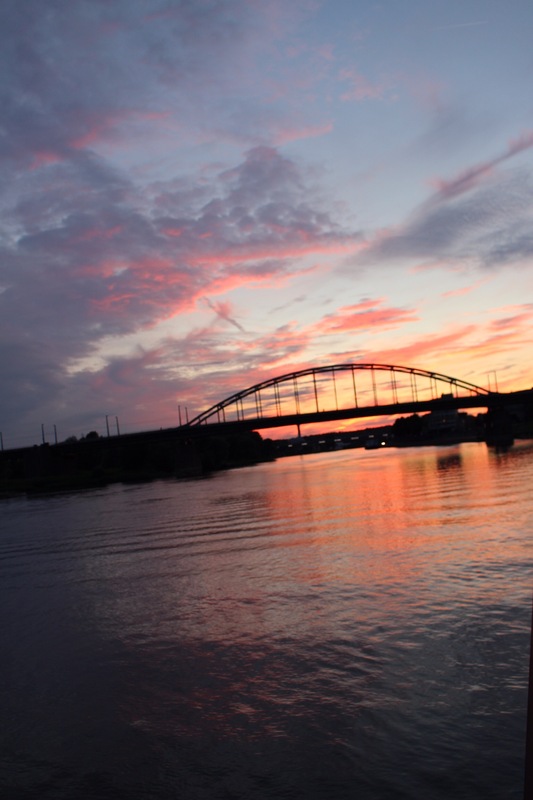 Steamed salmon, new potatoes and greens for tea in our room with a view, and as tonight is our last night in Holland thoughts are beginning to turn to Germany. 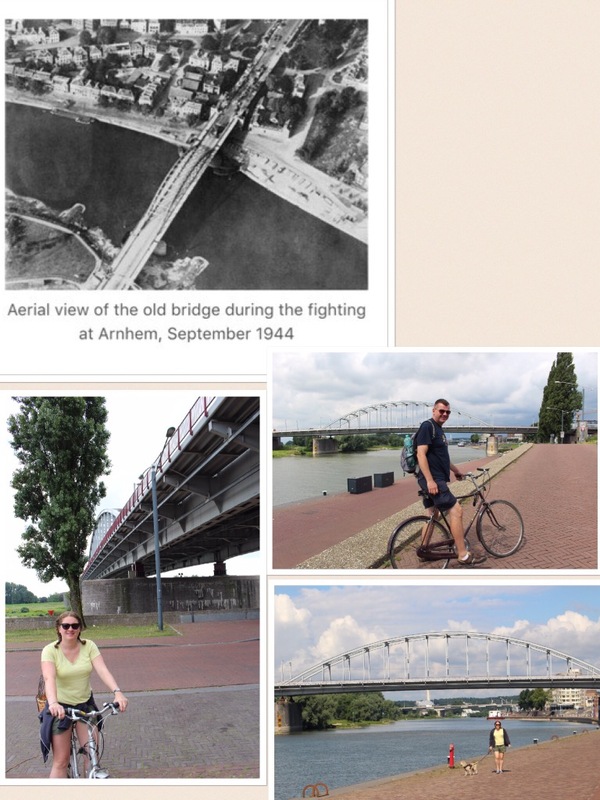 Loving your reports, but especially moved by the photos of Arnhem Bridge. I’ve stood there, and it is very VERY sobering.